One major hidden expense of going to university or college is paying for textbooks. Most people do not realize that a full course load worth of brand new textbooks from the campus bookstore can easily run over a thousand dollars! 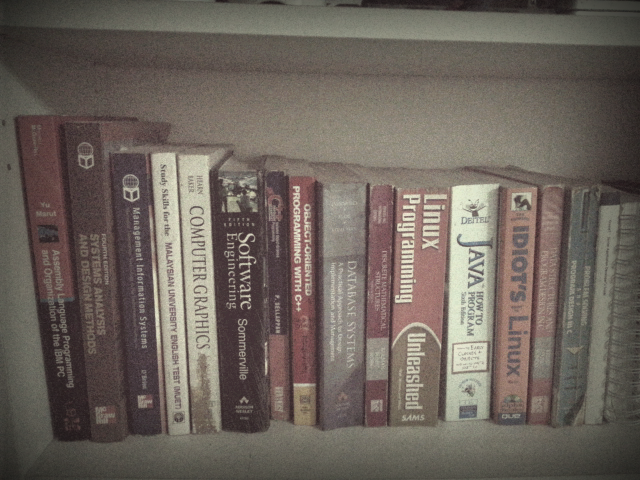 ...but at the end, the textbooks just sitting on their shelf collecting dust. For this problem, BookUp has solution for you. BookUp, is dedicated to help students and book readers to sell their textbooks or books AND also to allow people to purchase used books at lower price. BookUp in 70 Seconds from Mike Chu on Vimeo. As a student once, one of the challenge is having too many unwanted textbooks at the end of every semester during our college or university years. Plus the fact that many avid readers have too many books sitting on their shelf collecting dust. We could not bear to witness so many good books being sent to the recycling center or dumpsite. That is how this humble idea came out and started this project to solve the problem. At BookUp value books a lot! Who are in this project? This project is started by two young people, named Mike Chu and Jacqueline Khoo. Both graduated and worked in their respective career path for some time. It is because of the love of books that both of them decided to quit their job and dedicated months to start this project to help students and book readers. BookUp is currently based in Ipoh, Perak and still in the process of expansion to other states. Starting from January 2014, we will be going around to universities and colleges to engage with students. And for your information, USM will be our first stop.